Goodness gracious, I feel like I’m getting old. So just in name of reliving childhood a bit, Ive got a chocolate chip cookie recipe to share! Ok, so there’s avocado in it. But come on, coming from me, what else do you expect? IMPORTANT TIP WHEN MAKING THESE: I don’t know if it’s just me, but baked avocados kinda have a weird taste. Luckily, I’ve learned the secret to using them in a baked good: Wait a few hours (or preferably the next day) before digging in! Not only does all traces of avocado disappear, but the baked good gets a super rich taste and the avocado prevents the cookies from getting hard/stale! I recommend making these at night to have the next day, or in the morning to have later that night. Preheat the oven to 350 and grease a baking sheet. Place all ingredients (except the chocolate chips) in a food processor and blend. Stir in chocolate chips. Spoon cookie batter onto the baking sheet and bake for 18 minutes. Makes 18-20 cookies. Say what? Another post? All in the same week? This must be a record. Anyway, I HAD to share this recipe before St. Patty’s day. It’s too perfect not to! 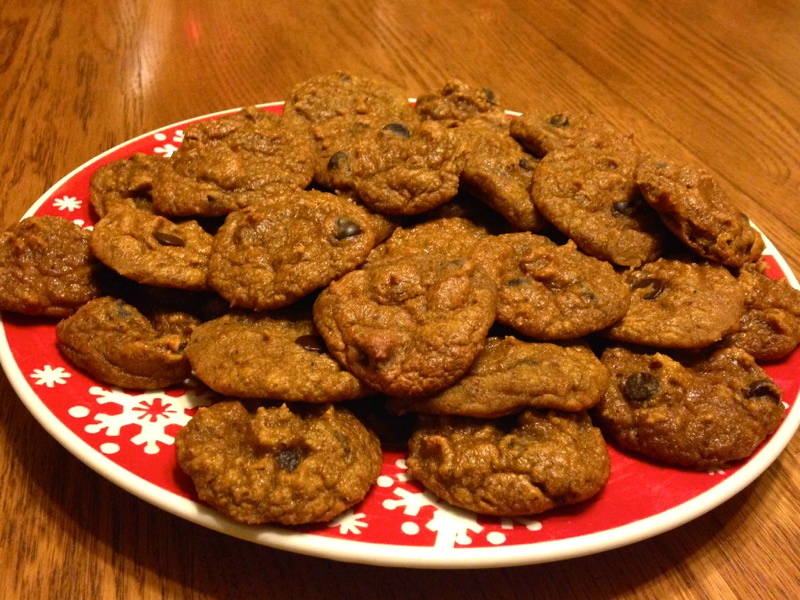 Here we have a grain-free and nut-free paleo cookie. But wait for it… take a bite and the inside is COMPLETELY GREEN. And nope! No color dye or spinach was used to achieve this effect. So what’s the secret? The combination of sunbutter and baking soda! It creates a chemical reaction that results in a green cookie. Just make sure to wait a few hours for the green to show up. I HIGHLY recommend waiting until the next day for the best results! Preheat the oven to 350 degrees and line a baking pan with parchment paper. In a bowl, combine the sunbutter, egg, honey, and vanilla. Mix in baking soda, salt, stevia, and sugar (if using). Add in coconut flour and chocolate chips. Roll into 12 balls and place on baking sheet. Press down slightly. Bake in the oven for 13 minutes. Allow to cool completely. Eat now OR wait a few hours for the green color to appear. I HIGHLY recommend allowing the cookies to sit overnight. The next day, the cookies will be completely green on the inside!!! All I want to do is make these cookies. But, finals are once again upon me and I only have time to look at this picture and salivate. The struggle is real. I think this will be the first thing I make once my semester is over. Here’s to 2 weeks from now! Preheat the oven to 350 degrees and line a baking pan with parchment paper. Combine squash, coconut butter, syrup, cinnamon, vanilla, and salt in a food processor. Blend until smooth and then scoop out all contents into a bowl (make sure to scape sides and bottom of food processor with a spoon as the coconut butter tends to stick!) Add in cocoa powder and stir until all the ingredients are evenly mixed. Place in the fridge for 5 minutes. Take out, drop into desired cookie sized-shapes on parchment-layered pan, and press down lightly. Transfer to the oven and let cook for 12 minutes. Let sit to harden before eating. 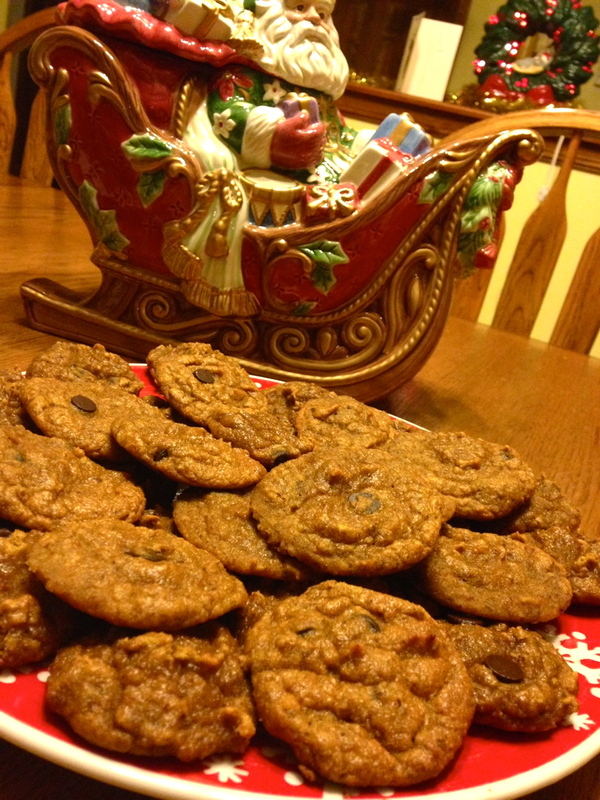 Time to join the blogging world’s festivities and post my holiday recipe! And what is more holiday-ish than cookies!? I know, I know. Everybody has had their fair share of cookies by now, but these cookies have actually kept me a bay from eating any other this season. Chewy and soft with a pumpkin flavor, I’ve been munching on these instead of the sugar-filled goodies. Plus, the recipe yields 25 decent-sized cookies- distributing the honey to a small amount per cookie. In a food processor, mix together coconut flour, tapioca flour, flaxseed, cinnamon, baking soda, salt, nutmeg, and cardamom. Add in egg, pumpkin, honey, yogurt and vanilla and blend altogether. Stir in chocolate chips by hand. Let sit for 5 minutes to thicken. Drop batter onto parchment covered-baking pans. Bake in the oven for 20 minutes for the bottom rack, and 25 minutes for the top. Check near the 20 minute mark to prevent burning.